Welzen Tennis - Guided meditation app for pros by Welzen LLC. 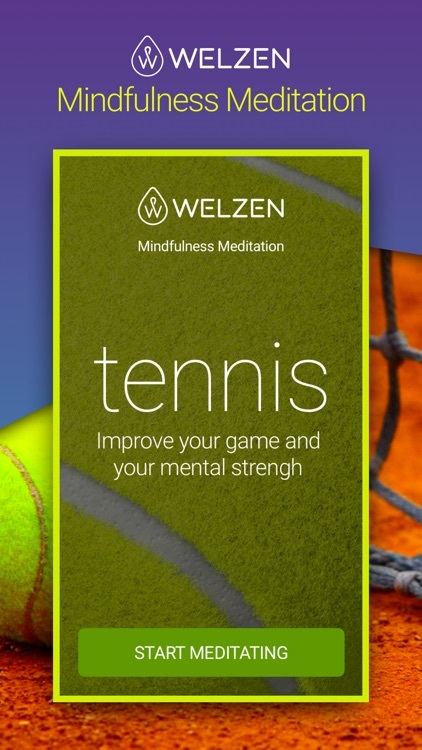 Welzen Tennis is a mindfulness meditation app designed to enhance your mental toughness and performance on court. Welzen Tennis will help you change your perspective, play to your advantage, and win more matches. You’ll be always ready for what’s coming! Mental toughness is key in tennis and can be further developed through a regular mindfulness meditation practice. 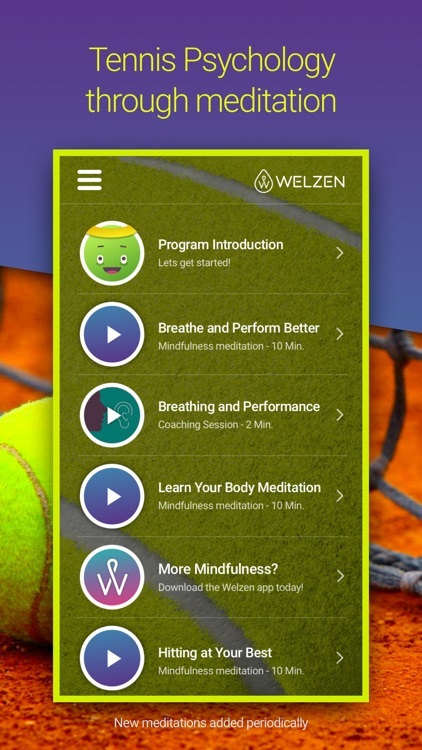 With Welzen Tennis you’ll have access to guided tennis meditations, mental game strategies, tennis psychology, tennis visualizations, and coaching sessions so you can gain some self-confidence and deliver the best of your tennis ability. 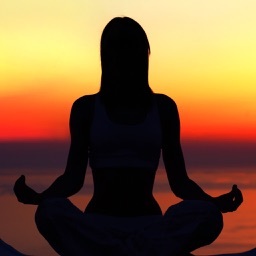 Tennis Meditations are great to observe how your body and mind reacts before, during and after a tennis match. 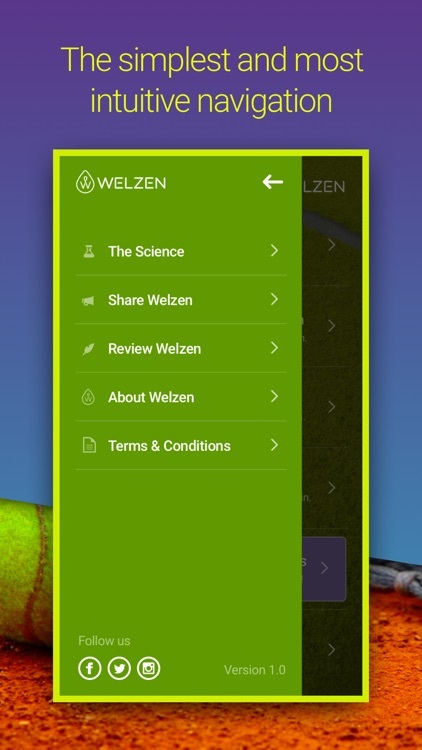 There are different levels of stress, pressure, doubt, confidence, and mental states in the life of a player, and Welzen helps you learn to observe and level set your mind so it plays to your advantage. 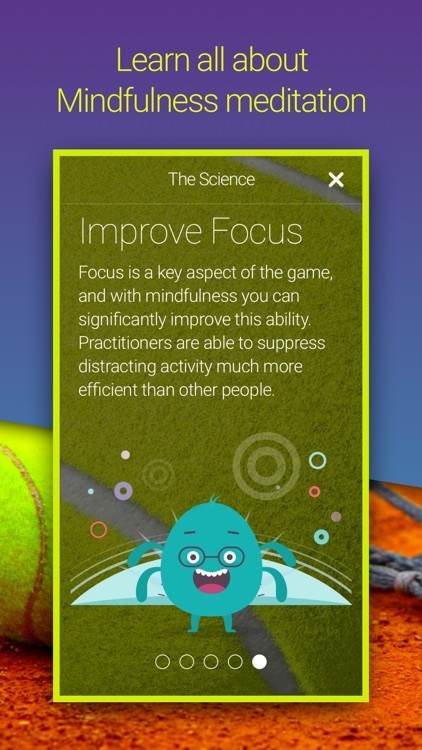 This is why we are thrilled to share this Mindfulness mental training app that we’ve created in collaboration with other partners within the tennis industry. 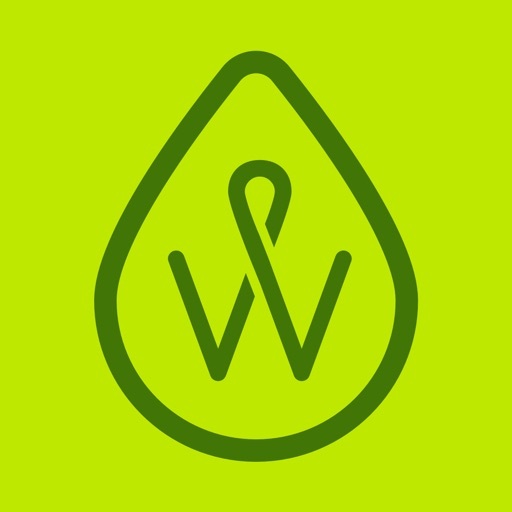 With Welzen Tennis you will learn to manage pressure and stress better, reduce anxiety, focus better, and enhance your strategy and decision making skills, so you can take your tennis game to next level and see greater results. 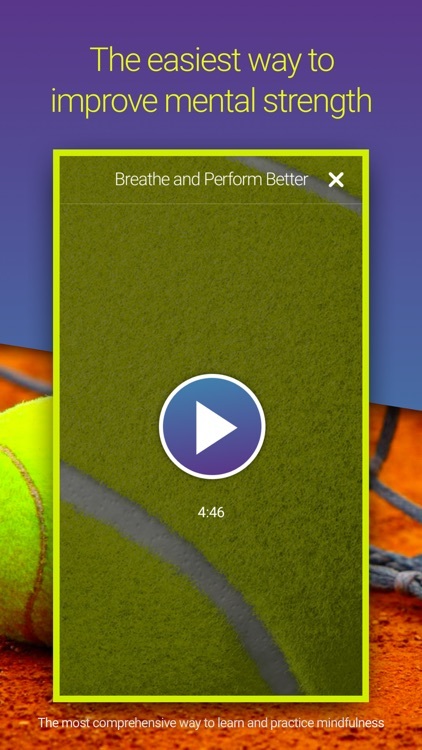 Welzen’s Tennis mindfulness meditation app is like having your own personal sports psychologist in your pocket; ready to help you out anywhere and anytime. Tennis players have a great deal of pressure and stress during tournaments. But gladly, research shows that mindfulness decreases “Cortisol” levels inducing a sense of calmness throughout the nervous system. In other words, your mind and your body become more relaxed, as they are freed from tension created by different thoughts and emotions. This relaxation will help you hit groundstrokes with higher confidence and precision. Studies show that mindfulness meditation reduces the grey-matter density in the brain which is related to anxiety. 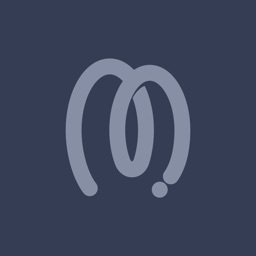 Also as you practice meditation you will learn how to manage your thoughts and emotions in a better way so they don’t affect the present moment, whether it’s before a tennis match or during a match, you will always be in control of “right now”. Deep focus is a key aspect of tennis, and with mindfulness meditation for tennis, players can significantly improve this ability. Studies show that mindfulness meditators are able to suppress distracting information and activity much more efficient than other people. In this way you’ll gain mental strength and be able to focus on what’s in front of you with greater attention and for longer periods of time. Every win and every loss in tennis is the sum of little decisions made throughout a match. Every single shot is a new decision that is packed with strategy and creativity to overcome your opponent. Mindfulness meditations for tennis has proven to increase divergent thinking, which is a primary driver for innovation. Also, as your mind is more relaxed, focused, and strong you’ll be able to make faster and more accurate decisions on the court. 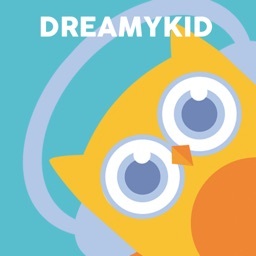 Recommend it to all your students. 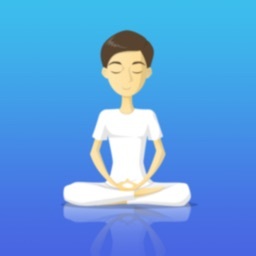 Super simple mindfulness program with lots of short and long term benefits. If I’m coach you, then, you’d be practicing this before and after every session. I’ve been using Welzen’s mindful tennis program because I used to get really tense before matches and I would get mentally blocked. Mindfulness has helped me become aware of my thoughts and emotions but most importantly gave me the ability to them pass and concentrate on my game. I was freaking out when playing singles. 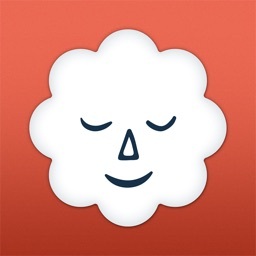 Practicing meditation with the Welzen app has help me keep a calm but confident mind throughout the game.